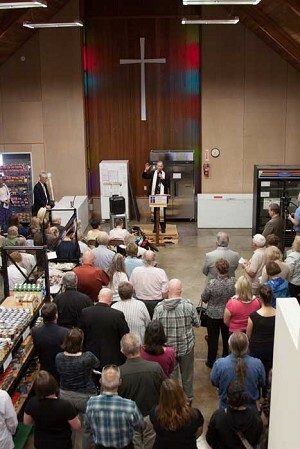 Archbishop Alexander Sample blesses the new food center in Springfield. Workers staff the new food distribution center in Springfield. SPRINGFIELD — A Catholic aid organization here has turned an unused Episcopalian chapel into a food distribution site for the poor. “We think it is a good repurposing of a place that was sacred,” says Tom Mulhern, executive director of Catholic Community Services in Lane County. The agency provides more than 1.5 million pounds of food to more than 22,000 people each year at locations in Springfield and Eugene. It is the largest distributor of free nourishment in the county. Archbishop Alexander Sample visited May 20 to bless Springfield’s new “Joe Softich Food and Resource Center.” The site, with vaulted ceilings and large cross on the wall, is named for the longtime employee who 20 years ago pioneered the shopping style of food pickup, which has become an industry standard. People in need are guided through food stocks and allowed to choose what they will use. That reduces waste and increases dignity, Mulhern says. In his remarks at the dedication, Archbishop Sample focused on human dignity. The archbishop said the project reflects a spirituality in which we see the face of Jesus in the poor. Catholic Community Services’ Springfield center has for more than a decade been located at the former Episcopalian/Presbyterian church. Until recently, people in need picked up food in a cramped space, with overflow outside. Check-in was confusing. The old chapel, with a high arched ceiling, was used for storage until officials decided on the new plan. The newly renovated center includes a centralized intake and larger waiting area, two handicapped accessible restrooms larger storage and distribution zone. Major funders of the $150,000 renovation were the Murphy Family, City of Springfield, The Collins Foundation, The Oregon Community Foundation and Oregon Food Bank. Christine Lundberg, mayor of Springfield, called Catholic Community Services an asset to the people of the city. “This is an excellent addition to all you do and all we look to you to help with in our community,” Lundberg said. 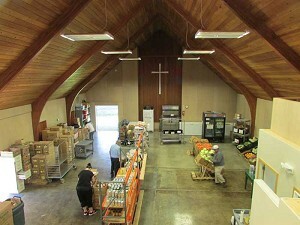 During the recession, need for emergency food climbed in Lane County. Hardship has not dropped off. About 15,000 households per year are helped at each of the Catholic Community Services locations, some of them families asking for food for the first time. The average household helped here comes for food three to four times per year, even though the rules allow them to come up to 20 times. “People don’t like to ask for help,” Mulhern says. Typical clients include a 30-something mother of three young children whose husband just died and a single mom who drove around the block three times before getting up the courage to stop. Neither had money for both rent and food. The two centers also provide clothing, personal care items, bus passes, utility assistance, temporary shelter and short-term financial aid. On a recent morning, Father David Cullings is working at the Eugene distribution center, letting clients know when their turn has come to pick supplies. Retired Marist chaplain and parish priest, he wanted to do something clearly in response to a call from the gospel. He has been volunteering every week for a couple of years.